I grew up in the Tasmanian ‘bush’. There I never thought twice about the importance of green spaces and being outside for people’s physical and mental health – I pretty much lived outside, climbed trees and walked barefoot. You couldn’t see another house from ours, only forest, paddocks, hills! Now I live on the third floor in Amsterdam. Sometimes I miss the bush – mostly not. But, I do want my two daughters to find the ‘outside-life’ normal. That they learn to climb trees and that it feels so good to walk with bare feet! Thankfully we live in Buitenveldert and have at least four parks and the polder within one and a half kilometres from our apartment – which means we get outside more easily. We have much luck that we live in such a green area and in a fairly green city! But, I know that many Amsterdam residents have much less green around them. A few probably don’t know better because they grew up like that (they can still discover it :). The majority do know how to find the green spaces in their neighbourhood. More and more often we hear that green spaces are important for us and for our environment in the city. For example, green spaces make us psychologically healthier, but also ensures cooling on warm days. A super nice initiative that I have come across is the ‘Urban nature map of Amsterdam’. With this the initiators try to map all the green (and blue) in Amsterdam (and surrounds) instead of the grey and red that is usually shown on a map of the city. A great way to discover green spaces in the neighbourhood, coming soon! 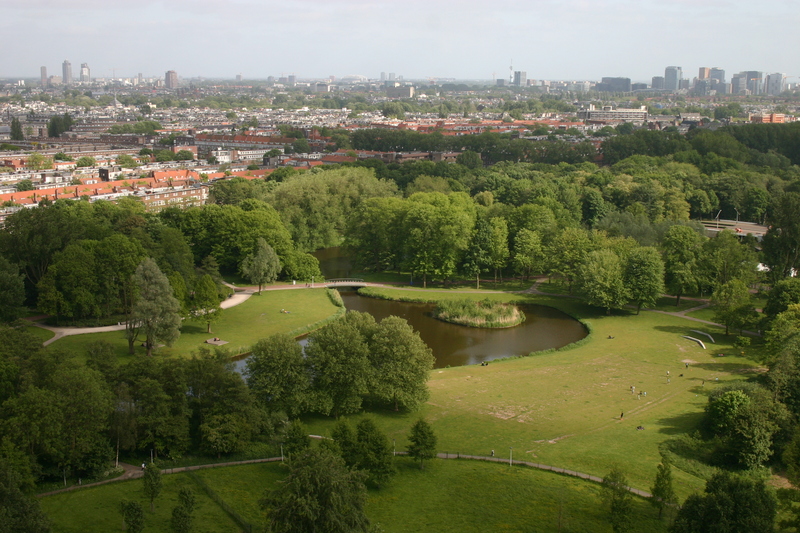 But… in Amsterdam alot more has to be built, putting pressure on green spaces. The City of Amsterdam does want green spaces that remain or are added do improve ‘qualitatively’. But how do we know when that is successful? What is good quality green space? How does the (landscape)architect decide what that looks like? Everyone has a different association with it. Where one wants wildness and gravel walking paths the other prefers neat lawns and comfortable seating. That is what my research is about. I want to know what (different) people’s preferences are so that that knowledge can be incorporated in the improvement of existing green spaces or in the creation of new green spaces in new, to be developed, areas. It will help ensure that green spaces in the city are attractive, functional and accessible – for everyone. My PhD research started in the Rembrandtpark with the use of an app to measure preferences for green spaces and the park. I also surveyed people in the park to be able to compare their answers with those in the app. I am now busy with analyzing the results, and have put a short selection online on the results page. On the results page you can see a map of the subjective answers given by people about how they experience specific locations – for example, how lively, noisy or relaxing was a location. I did need to search for the right way to visualize all of this information, and I hope that the map are nice, and clear, like this. Under the map you can see two figures that show how much respondents wanted to see certain changes and how satisfied they are with (aspects of) the park. For this I have combined the answers of the app and the surveys. Part of my research is actually about why these answers differ so much, but to make it easier I have combined here them so that each respondent has an equal say. Using the results I also wrote a little report for the City of Amsterdam (in dutch) and those that are responsible for the renovation of the Rembrandtpark. You can also download this on the results page. In this report it is clear that both methods ‘catch’ a different type of park visitor. I am now working on analyzing the results. I will see how different the methods are and if they are representative of ‘the Rembrandtpark visitor’. Also I want to analyse preferences for different locations in the park. One important point that is already clear is that certain groups of people are strongly underrepresented, for example people with a lower education or those with a migration-background. This is, sadly, quite normal for surveys, but it is an important point of attention to be able to ensure that green spaces are attractive , functional and accessible for everyone. In scientific jargon this is called ‘environmental justice’. I hope that with future research I can also include this – see if I can get each layer, type, colour person in Amsterdam to give their opinion about the green spaces in their surroundings, their park, their city!